Do you want to organize a Sweepstakes among all users who comment on a post published on your Facebook page and you want to set a deadline? In any sweepstakes it is always advisable to indicate in the terms and conditions any information that may be useful to the user, such as the dates of the promotion, as well as the deadline. In this way, in any Sweepstakes you should set a start and end date, and specify these dates in the terms and conditions so that users know the time they have to participate. There is also a type of sweepstakes where it is especially important to clearly indicate the closing date of the promotion: in pools or prediction promotions, where users have to guess the results of a sports match, a sports competition or any other future event. In this type of competition is is vital to set a deadline so that users can make their predictions, always taking into account the date of the event or match. 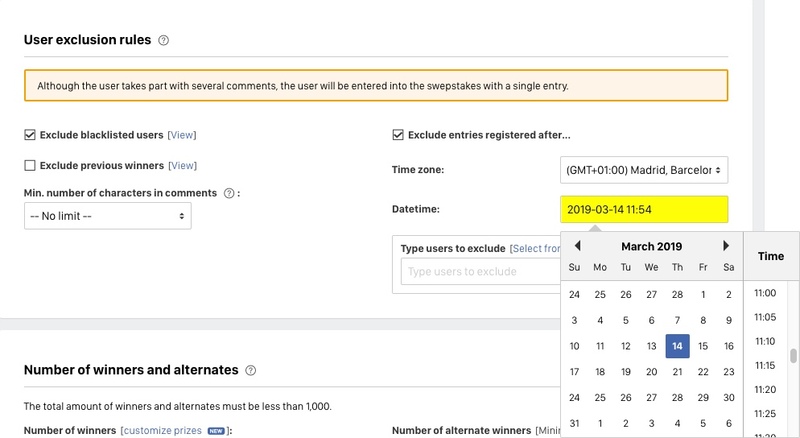 To give solution to this type of sweepstakes, where it is vital to close the participation to a specific date and time, the Facebook Sweepstakes application incorporates the functionality ‘Exclude entries registered after’, which allows to indicate the closing date of the draw, so users who registered after this date are not entered into the final draw. This will ensure that users who participated when the event or match was already held and, therefore, when the the result is known, are not entered into the draw. Note: This functionality is available for all Facebook Giveaway based on Comments, Instagram Giveaways, Twitter Replies Giveaways, Youtube Giveaways and Multi-network Giveaways. 1. Once published the post on your Facebook page and the time to participate is closed, you’ll be able to access the Easypromos control panel and select the post of the sweepstakes. Follow this tutorial which will guide you through the first steps. Time zone: select the timezone where you are located. Date and time: all users who comment after this date will be excluded from the drawing. 3. Now you’ll be able to indicate the number of winners and alternates you need and carry out the sweepstakes. Note: You can follow the steps in this tutorial that explains how to select the winners and publish the results on the page. Why use hashtags to "comment" in Facebook Sweepstakes?